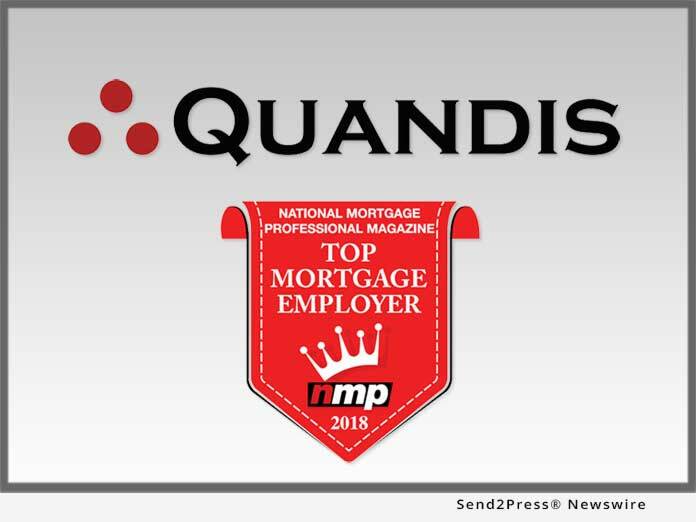 RANCHO SANTA MARGARITA, Calif., Apr 05, 2018 (SEND2PRESS NEWSWIRE) -- Quandis, Inc., a leading default management mortgage technology provider, announced that it was named to National Mortgage Professional magazine's (NMP) Top Mortgage Employers list for 2018. Quandis was one of only ten companies to be included in the publication's 'Services Providers' award category. "We are honored to be recognized as a top mortgage employer by National Mortgage Professional magazine," said Scott Stoddard, CEO at Quandis. "Our incredibly dedicated and talented staff is the backbone of our ongoing company success. Being acknowledged by NMP with this award is the direct result of and a testament to the hard work and determination of Quandis employees." NMP magazine is one of the mortgage industry's leading go-to sources for extensive news coverage for mortgages, origination, compliance, secondary marketing, servicing, settlement, technology, trending, and more. Founded in 2003 and headquartered in Rancho Santa Margarita, California, Quandis is a leading default management software provider specializing in web-based solutions for the mortgage industry. Quandis' solutions include foreclosure process automation, short sale portals, skip tracing systems, a valuations hub, military search services, bankruptcy status searches, collection solutions, vendor solutions, as well custom application development. The company's clients range from servicers, to foreclosure attorneys, lenders, banks, GSEs outsourced service providers, and agents and brokers. Awards and Honors, Employment and HR, Mortgage, Quandis, Inc.